Lonhro was known to many as "The Black Flash". but unlike many of his modern day champion contemparies, Lonhro provided more theatre with the way he went about defeating opponents. Against the grinding performances of Might & Power, Sunline and Co., Lonhro was more about speed as once he found clear galloping room in a straight his top gear was generally too good for most as he won 26 of his 35 race starts..
Sydney’s radio broadcaster Ian Craig best encapsulated the impact Lonhro had on a given race. As a field with Lonhro as the headline act swept for home, listeners were placed in suspense as Lohnro generally placed himself in the second half of a field. As Lonhro like a well-oiled lamborghini went through his gears so it was echoed through the reassurance of Craig's voice as you knew that Lonhro was about to put the final piece in the race puzzle as he hit top gear. Rarely did he let you down, only the extraordinary undid Lonhro. Whether it was his power, speed or his look Lonhro attracted many adoring fans.
. It all began in 2001 when an unknown but striking black colt was taken to the centre of the Caulfield track in near enough to last position. He then set about thundering down the outside and in the process managed to pick off each and everyone of his rivals in a star-like debut. The reputation grew from there as the competitors first became tougher and then gradually faded as the brilliance shone. Perhaps it was the quality of the time but Lonhro only had to beat small WFA fields, one would like to think it was more about the intimadation that Lonhro brought to a race than any other reason. 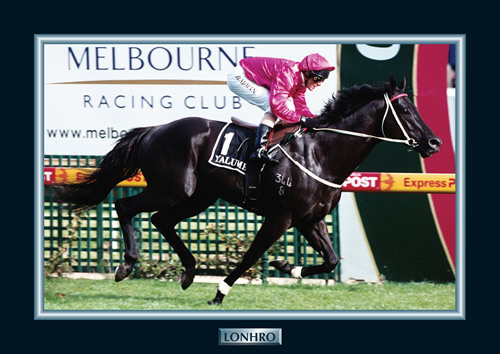 A marvel from all distances up to and including 2000m Lonhro was a brilliant racehorse and striking specimen.